Stuck On You offer a huge selection of labels with different sizes and intended uses. We understand that it can get a bit confusing when trying to choose the best label to use so we've put together a guide to get you started! What is the difference between Iron On and Stick On Clothing Labels? Iron On Clothing Labels are a permanent transfer that embeds into the weave of the fabric. The flexible material allows it to move and stretch with the fabric, essentially becoming a part of the garment. 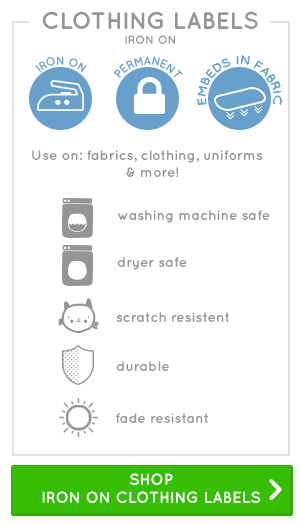 Iron On Clothing Labels are safe for the washing machine and dryer. Stick On Clothing Labels are a temporary solution made from woven material, with glue adhesive on the back. Simply peel off the backing and stick the label on your garment (ideally to the tag or care label). To make this a longer lasting solution you can iron the label down, which will cause the glue to melt and bind to the fabric. Alternatively, you could sew it to the garment. This will make it safe for the washing machine and dryer. What is a Multi Use Label? Multi Use Labels are a fabric label with a sticky backing that can be used on just about anything. It’s safe for the washing machine, dryer, microwave and dishwasher. Stick to clothing and fabric for a temporary label, or make it permanent by ironing or sewing to the garment. These are great if you need to label camp bedding, towels or school uniforms in a hurry. You can rest assured the label will stay put until you have time to iron or sew it on. These labels can also be used on food containers, lunchboxes, books and other hard surfaces, making them the perfect all-rounder. Can I add my address or phone number to a label? There are a couple of ways to add extra details like address, phone number, email or a medical condition. Address Labels – Basic have space for four lines of text, and each line can fit up to 25 characters. Choose a font, colour and enter your desired text. These are perfect for use in the Home office and for a quick Return to Sender label for letters and invitations. Address Labels – Designer have the same amount of space, however you can also choose a cute design icon to appear on the label. Both of these labels allow you to choose your preferred font. Please note, these are a paper label so they aren’t safe for the dishwasher. For a vinyl-coated label that’s safe for the microwave and dishwasher, try a Custom Text Label. You’ve got 5 lines of text with space for 25 characters on each line to personalise any way you choose. If you’re looking for a fully customisable sticker label, this is the answer. Great for highlighting allergies, especially for items in the kitchen, or for people with long addresses to use on their luggage. Can I highlight my child’s food allergy? Bring awareness of your child’s allergy to teachers, carers, parents and your children’s friends. The big, bold icons are a great reminder to kids that they need to be aware of sharing food etc. Choose a colour, font and add your child’s first name and surname. Basic Custom Text Labels are a fully customisable sticker label. You’ve got 5 lines of text to add your own information. Great for highlighting allergies, with plenty of space to add further details of your child’s allergy (particularly if it’s not a food allergy) home address, phone number and the number of your local GP or emergency contact. Which labels are best to use on clothing? For clothing labels that won't budge once they're applied, try Iron On Clothing Labels. They are a permanent transfer that embeds into the weave of the fabric. The flexible material allows it to move and stretch with the fabric, essentially becoming a part of the garment. Iron On Labels are safe for the washing machine and dryer. 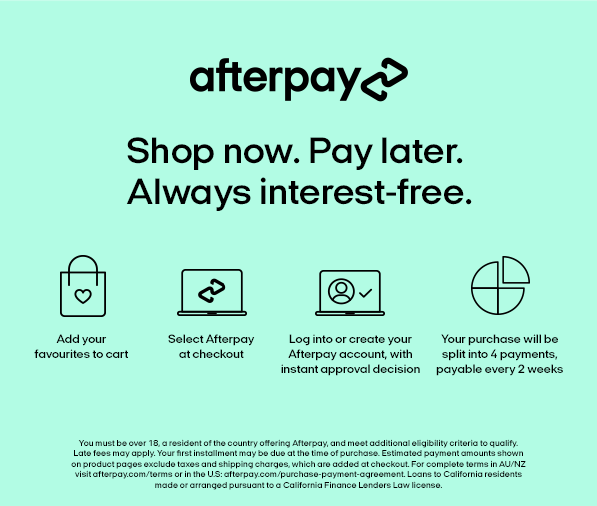 If you don't want to commit to a permanent clothing label, we also have Multi Use Labels - a more temporary solution made from woven material with glue adhesive on the back. Simply peel off and stick the label on your garment (ideally to the tag or care label). To make this a permanent solution you can iron the label down, which will cause the glue to melt and bind to the fabric. Alternatively, you could sew it to the garment. This will make it safe for the washing machine and dryer. Which labels are best to use on shoes? 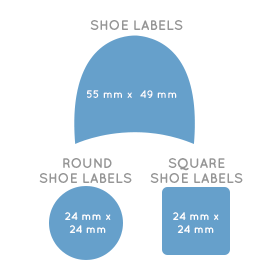 We have a range of Shoe Labels that can help your child identify their shoes, and also teach them left from right. These come in a range of shapes, sizes and colour combinations, include a Classic Shaped label to fit into your child's shoes perfectly, Left & Right Shoe labels for a fun way to help your kids learn which shoe goes on which foot and we have our ever popular Round Shoe Dots and Square Shoe Labels that can both double as normal name labels. What are the best labels for School? Our super sticky name labels for school are safe in the microwave, dishwasher and freezer, plus they're coated with a scratch resistant coating making them waterproof and super long lasting. We also have popular iron-on options, which are easy to apply and come in a variety of sizes so you put them exactly where you need to and know that once they're ironed on, they won't come off. If you want the best of both worlds, we have adhesive multi-use labels that will stick to nearly any surface you can think of, from your Tupperware collection to the kids' swimming gear and everything in between. If you need quite a few labels for school stationery, why not consider a Value Pack? 5yrs+ School Value Pack has 18 x Large Name Labels, 26 x Medium Iron On Clothing Labels, 50 x Mini Name Labels, 18 x Square Name Labels (perfect for School shoes!) and 1 x Personalised Bag Tag. This will save you money and cover a few bases in one hit. Our Iron On Clothing Labels are perfect for uniforms of all kinds (sport, school and work). 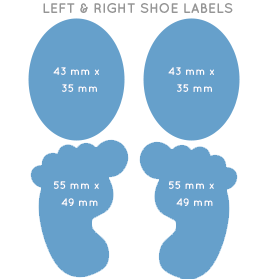 We also have a range of Shoe Labels that can help your child identify their shoes, and also teach them left from right. These come in a range of shapes, sizes and colour combinations. If you’re looking for thin, durable name labels for pencils, check out our Mini Name Labels or Mini Multi-Use range. There is enough space for you to add a first name and surname to the label, which measures 46mm x 6mm. Choose your favourite colour combination, design icon and font. These are also perfect for smaller surfaces, such as lids and medications. The size makes them very discrete, but also extremely durable. For something a bit fun, try out Geometric Shapes range. You can choose between a pack of 16 or 32 labels in a funky geometric shapes with lots of colour combinations to choose from, and space for a first name and last name. We also have a range of Book Labels, which come printed with the words “This book belongs to” and you can add your child’s name, choose a font and a cute design icon to match their personality. What are the best labels for home? Organise your family with our practical range of Household Labels. From the kitchen, to the laundry, to the home office - we've got the perfect labels to keep your home organised and tidy. All our name labels and multi-use labels are waterproof, microwave, dishwasher and freezer safe and are coated for extra scratch resistance, while our paper address labels make an easy Return to Sender sticker solution for the home office. Classic Round Name Labels are a nice size for food containers, and you can order these printed with both a first name and surname. 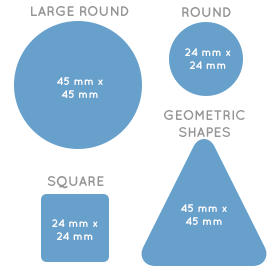 You’ll receive either 26 or 52 labels in a pack, measuring around 24mm in diameter. They sit nicely on lids, containers and are microwave and dishwasher safe. Clear Large Name Labels are great, because you just have one line of text available. So you could simply type your surname, and then you’ve got a handy microwave and dishwasher safe label. Choose what colour you’d like the text to appear, and it will arrive printed on a clear name label. It’s a good “grownup” option because you don’t need to add a cute design icon. If you’re sending the kids away on camp, it’s a good idea to label all towels, sheets, sleeping bags and other items to ensure they are returned safely. 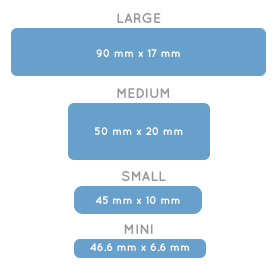 Multi Use Labels – Designer Mini are a discrete sized label measuring approximately 46mm x 6mm. The fabric label can be stuck down temporarily, or made permanent by sewing or ironing to your chosen item. They’re great for shared items like beach towels, bath towels, camping gear and overnight bags. 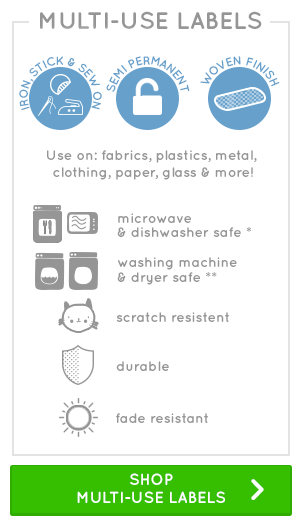 The fabric label is safe for the washing machine and dryer, but it’s also safe to use in the dishwasher and microwave so you aren’t just restricted to using these on linen. Choose from a pack of 50 or 100 mini labels, and with two lines of text you could get creative and enter “The Smiths” (inserting your own family name in the second text box). 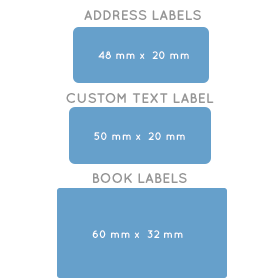 Basic Address Labels are a large label (48mm x 20mm) but there’s space to add 4 lines of text. The Address Labels are paper labels with a scratch-resistent coating making them perfect to keep in your desk to quickly and easily pop return address stickers on envelopes and parcels. What are the best labels for Daycare? When your little one is too young to recognise their name, it’s all about the design icon. We have an enormous range of icons available, many of them in familiar designs that will appear to small children including food, animals and sports gear. It’s a great way to help them to start being aware of their own belongings, ensuring nothing ends up in the Lost Property box. A name label is also vital for carers and teachers so that they can quickly identify what belongs to each child. Make the daycare drop-off that bit less stressful knowing that all your little one's favourite items will be safe and sound at kindergarten or nursery. We listened to our customers and we've put together the 0-5 Years Preschool Pack with everything you need for the Daycare drop off. With 178 labels including versatile name labels, a selection of iron ons and a cute personalised bag tag to boot - this pack has ALL the essentials covered. Children are notorious for kicking off their shoes and socks at every opportunity! Shoe Labels are a great choice, and you can add your child’s favourite icon to each label. These have a scratchproof, sweat resistant coating - no need for a separate overlay like some of our competitors. Iron On Sock Labels measure just 5cm but are still easy to read despite this tiny size. Iron inside the top of each sock and prevent mix-ups between children who all wear the same colour socks to daycare, kinder and school. Assign each child a certain colour so that they can recognise their socks even if they are too young to read their name yet. No hat, no play! Make sure you aren’t replacing expensive hats this year by clearly labelling it before the hot weather arrives. Multi Use Labels – Designer Large are a good size for hats, and can be stuck inside the rim. These fabric labels are safe for the washing machine and dryer, and can be ironed on for added durability. You can choose between 18 or 36 labels in each pack. If your child is required to bring their own drink bottle to daycare our Shaped Label is a fun option. Choose from tonnes of different shapes and brighten up a blank bottle. You can choose up to 36 labels in each pack, measuring approximately 4cm. These are safe for the microwave and dishwasher, and obviously won’t come unstuck when wet. These labels are also great for lunchboxes and books. There's nothing worse than having a pacifier (or twelve) go missing. If you feel like you're forever buying packets of dummies and pacifier clips you'll love our super versatile Mini Multi Use Labels. These are a woven style that wrap around tricky surfaces with ease. Wrap it around the pacifier ring handle and stick the label back onto itself for an easy-to-see and long-lasting solution. Choose our super cute Designer labels and find a design that fits your child's personality juuust right. * A dimpled or rough finish can allow water to get under the label in the dishwasher, causing it to become unstuck. We recommend that you stick your labels to a clean and smooth surface to get the very most from your labels. Once applied do not wash the item for at least 48 hours to allow the label time to bond. For best results hand wash only. ** For best results in a washing machine and dryer, iron and sew down labels.